On the cover: Spherulites of the stable polymorph of cholesteryl acetate growing in the liquid crystalline phase on cooling after complete melting (crossed polars). 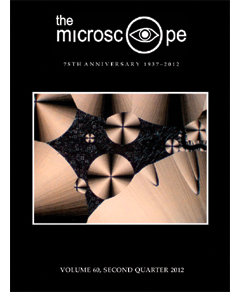 See “The Microscope Past: 50 Years | Some Simple Chemical Experiments with the Microscope” by Walter C. McCrone, page 87. Photomicrograph courtesy of Gary J. Laughlin, McCrone Research Institute. Professor Ford’s new theory has also been published as The Big Burn Theory in New Scientist, August 18, 2012, pp 30-31.